Over the years, I have met a lot of people with type 1 diabetes at events like conferences, Walks to Cure Diabetes and support group meetings. It’s hard to keep up with everyone, which is why I enjoy blogging so much. The Internet is constant and my blog is (almost) always here, even when I’m not so I never have to worry about missing someone. I have met a lot of people at the events that I have kept in touch with over the years, but rarely have time to see because of distance and other scheduling factors. So when I found out that Mollie and Jackie Singer were in New York City before they left, I jumped on the chance to see them. Mollie and I played Facebook Wall tag for about a day before we finally nailed down a time to meet. It was Friday night and we were going to meet at Penn Station for dinner. It was a windy, rainy mess of an evening and I tried to contain my anxiety about missing the train to New York City. 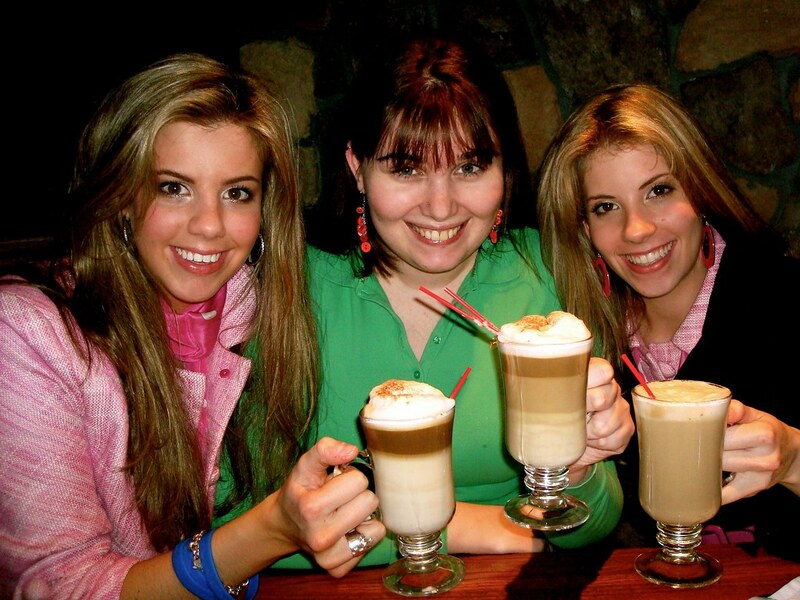 Mollie, her twin sister Jackie (who does not have diabetes but who knows more about the disease than most people with diabetes) and their mother, Jackie (who also happens to have a twin sister named Mollie – funny, no?) met me at Penn Station before we ventured back outside for dinner. I picked Harrington’s Bar and Grill, a restaurant I had been to a couple times before and it has a great proximity to Penn Station. It’s just one block away and you only have to risk being killed by a taxi cab once. The waitress led us to their upstairs dining area where it was slightly quieter away from the bar. Mollie, Jackie and I have known each other for over five years and I initially met Jackie at Children’s Congress in 2001. I recognized them from all the JDRF videos and promotional material that I had seen, but I didn’t get a chance to meet Mollie because of how busy we were as delegates. Not that it ever really mattered. Mollie, Jackie and I worked together for a couple of years on the original Diabetes Teen Talk, which at the time was “Teen Talk @ Diabetes Station.” Mollie and Jackie and I rotated hosting duties for the weekly chat. Mollie has also helped me on numerous projects over the years, so it was a thrill to finally meet in person. The first part of the conversation revolved around why Mollie and Jackie were back in New York City though I’m sure Mollie will eventually post all the details on her blog so keep an eye out. We talked about how I ended up in New Jersey and I gave them a crash course in what I do for a living. I joked that six months after I started working in digital media for a public relations agency, my father was still asking, “But what does that mean?” I don’t know if I’ll ever be able to properly explain it, but I did feel successful when I introduced Mollie and Jackie to the idea of “microblogging,” which is blogging in short form rather than long prose. The most popular tools for microblogging are Twitter and Tumblr. We also talked about diabetes advocacy and what it’s like to go from a child advocate to an adult advocate. Mollie and Jackie started a project called the Diabetic Angels at their school when they were younger, and now different chapters have popped up all over the world. They are planning on continuing to grow this project. I mentioned how when I was selected to be a Children’s Congress delegate how mad I was at myself for starting so late. “I remember telling my mother, I only have three more years!” I told them. We all agreed that it was important to continue this advocacy work even though we were passed that cut-off point for being a “juvenile” and hopefully it will help make people aware that this isn’t a children’s disease. I think we’re growing up quite well, if you ask me.